Do you remember spending endless hours on the beach flying your kite as a kid, hoping the wind would blow just right as it soared through the air? 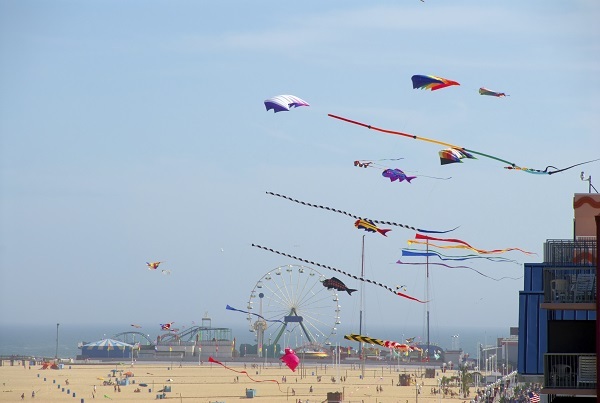 It's time to find that inner-childhood again and head out to the Ocean City MD beaches this month for the Maryland International Kite Expo. "Go Fly a Kite" has a whole new meaning for this expo! From April 26-28, venture over to the beaches between 3rd and 6th St. in town to see the sky filled with colorful, unique kites. Throughout the three-day festival, there will be various exhibitions and demonstrations such as stunt and power kite lessons. Enjoy free children activities and games for all ages and so much more. Think you are a great kite flyer? Test your skills! This International Kite Expo will showcase some of the best kite flyers from all over the world. Explore all looks and types of kites out there, some of which will be massive in size. You may even see a few recognizable characters flying around in the sky. There will be Mid-Atlantic Stunt Kite Championships Events throughout each day including Sport Kite Demos, Giant Kite Shows, and Lessons to learn to fly. As with any event, Kite Loft, the Town of Ocean City MD, and everyone involved in the International Maryland Kite Expo want you to enjoy the event. Be aware of your surroundings at the expo, always looking up and down as you walk along the beach. Please do not touch the kites, lines, or surrounding ground displays without permission! Steer clear of the competition or demonstration fields, especially with young children. Most importantly... Have FUN!